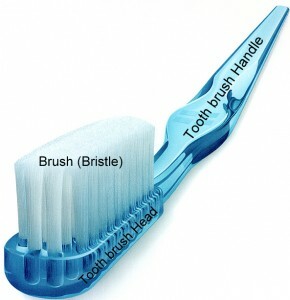 A toothbrush mainly has three main components which are the head, the brush and the handle. There are usually three types of head size, medium, large and small, the size of the head is usually chosen based on the size of the individual’s mouth. This is also the general guide of toothbrush sizes. For adults, large or medium sized heads would be sufficient. However if the adult has wisdom teeth and has problem cleaning the teeth, a small size head would be recommended. Small size heads are recommended for children as their teeth and mouth are generally smaller. The toothbrush materials that makes up the head is usually a plastic or nowadays some rubber is incorporated inside to provide flexibility. The latest additions to toothbrush heads are tongue cleaners, mostly used to clean the tongue and also majority of the mucosa in the mouth. Bacteria is mostly found on the tongue and other parts of the mouth, not all the bacteria seats on the teeth. So this tongue cleaner helps clean the majority of surfaces in the mouth. Latest toothbrush heads are also flexible. The head is split into two parts and join together by a rubber portion, so that it bends and curves to follow the curvature of our teeth as we brush. It also helps us to excess hard to reach places. Toothbrush materials, brush or bristles of the toothbrush are made from nylon material. Broadly it can be categorized based on the texture of the brush . Which are soft , medium and hard. Mostly dentist would not recommend a hard textured brush because most people do not brush the correct way and the use a very high force to scrub and brush their teeth . This eventually results in tooth abrasion (wearing off the teeth due to constant force from a foreign object). Soft bristle toothbrush texture are usually recommended for those with wrong brushing technique or sensitive teeth. Ultra soft toothbrush might be recommended mostly for people who underwent surgery in their mouth. For most people, a medium size texture toothbrush would be sufficient to clean the teeth, without causing and unnecessary damage. Latest brushes are micro fine (very small and fine ) bristles. Design to massage the gum’s to keep it healthy and small and fine enough to reach in between the teeth. Some even have whitening agents incorporated into it , to whiten the teeth. Hence they are called whitening toothbrush. Bristles are also arranged in different patterns nowadays , no more straight cut patters. Some have criss-cross patterns for larger surface area brushing, hence earning names like cross action toothbrush. Some bristles are also arranged together with rubber cusp in between to polish and whiten the teeth. Most handles are made out of plastic, some have rubber coatings for firm ergonomic grip. The shape of the handles has also evolved, slightly curved handles are there to follow the natural grip of your fingers. Some handles are also custom designed for special needs. For those who are not able to hold the handles properly, straps are attached to the handle so that is can be strapped to the fingers. Mostly and indication for people who cannot grip properly. For example, for those with Parkinson or Down syndrome disease. What is an ideal Manual Toothbrush or the best toothbrush? So your ideal toothbrush should have a suitable size head for your mouth. Preferable has a tongue cleaner. Doesn’t necessarily have to be flexible. For the brush or bristle component, ideally a medium texture brush would be preferred , it is just tough enough to ensure proper brushing.Brush bristles arranged in different patterns can be neglected, as long as you can brush with proper methods, the patterns doesn’t really matter. However, those with polishing rubber cups would be ideal for those with heavily stained teeth. The handle should be able to give you a good grip while brushing. So those with rubber coatings are quite good. There are many different types of manual toothbrush brands in the market nowadays. For example to name a few leading brands like Oral-B , Colgate and Jordan. The manual Toothbrush price can range from USD 1.00 to USD 15.00. What Is the Function of a Toothbrush?